If you read the newspapers today, you might have caught a piece about the violent clashes between protesters and the army and police. I read one and it made me think the city was under siege. In some ways it is, in some ways it isn’t. Being here, I get the feeling it’s sort of like how outsiders view California. When there’s an earthquake, out-of-staters might think it was felt from Los Angeles to San Francisco. When a wild fire ravages coastal communities, a person who only reads the paper gets the impression that my backyard is burning . It’s the same phenomenon that makes people think that every Californian owns a surfboard and lives near the beach. After all, the newspaper headlines say “California wildfires” and the TV only shows people who are pretty and live near the ocean. Both give the impression that California is less complicated than it actually is. I’ve experienced a bit of the same here in Bangkok. Last night I watched the rally at the intersection near many of the major Bangkok malls. It was tense at moments, sure. They did parade the bodies of fallen comrades on the big screens. There were defiant cries to fight on. More than that, though, it was surreal. A two pop song set from some old, long haired queen? Vendors selling food, clothing, and other merchandise, some totally unrelated to the Red Shirt movement? A sophisticated camera on a boom taking swooping video of the dancing, singing crowd? It’s all missing from the news stories. Also missing is the stuff happening in Bangkok despite the unrest. Sure, major intersections have been shut down, some public transport’s been suspended, and major shopping centers have been closed. That’s all true. All of it has changed the regular hustle and bustle. Traffic going towards the demonstration sites is significantly lighter than traffic headed away. The streets are quieter and there seem to be fewer tourists. The city has even, to my dismay, cancelled the water festival activities associated with the Songkran holiday. There are, however, significant pockets of normalcy. 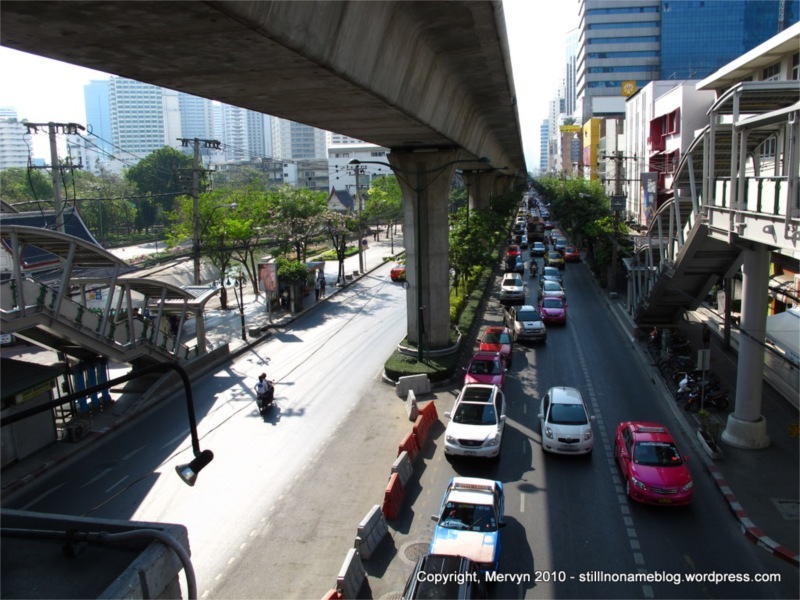 I took a walk along Sukhumvit road today, this time away from the area surrounding last night’s excursion. I did this mostly out of necessity since Skytrain service from the closest station had been suspended because of the unrest. I headed to Emporium, a shopping center 1.5 kilometers from my hostel. (Yes, I’m going metric, mostly because I’m lazy and the map I’m looking at only has it in meters.) It was hot out as it tends to be around lunchtime. When I got to Emporium, it was less crowded than I’d expect for a weekend. However, the food court was packed. Locals sat around reading, having coffee, and chatting over their meals. 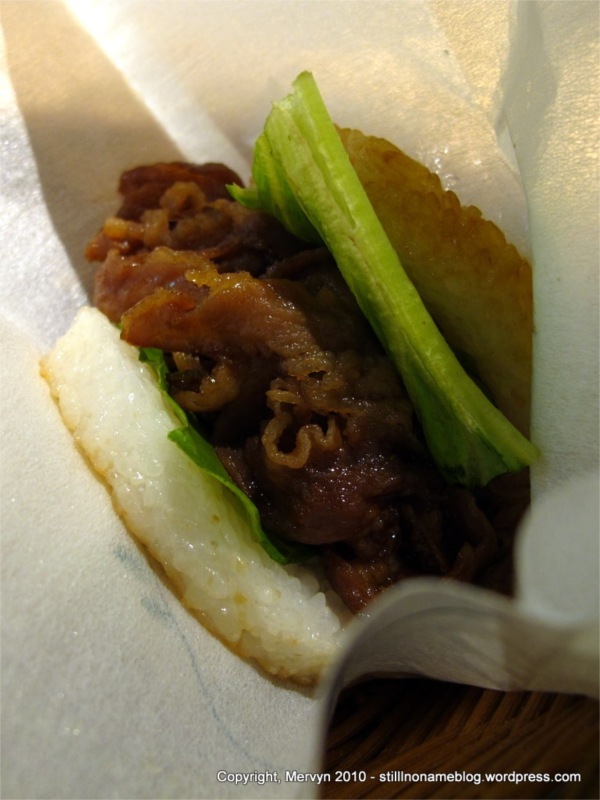 I decided to have a “Japanese burger” at Mos Burger and inadvertently ordered sliced beef between two slabs of sushi rice. I ended up chasing French fries with bites of beef and rice. Odd, but flavorful. It was a bit unsatisfying, though, because it was small and not what I expected. Despite the chaos in the streets, I felt safe enough to snap a pic of the food. The mall seemed mostly insulated from the Bangkok portrayed in the news. I got the same feeling when I walked through the adjacent Benjasiri Park. 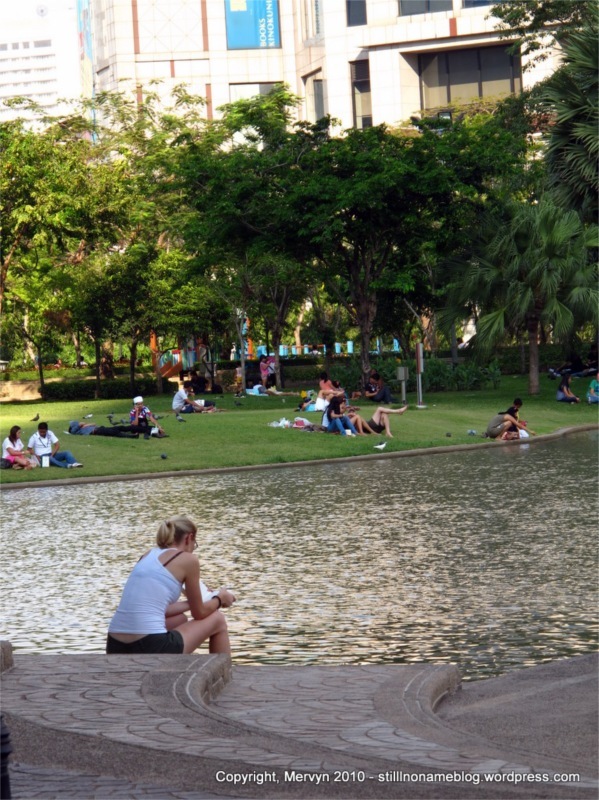 People were lounging in the shade, chatting with friends on the grass and reading by the lakeside. There was a skateboard park busy with miscreant youths. There were two courts where guys were playing that volleyball game where you use your feet and head instead of your hands (joga?). There was even a basketball court busy with a full-court pickup game. I sat down and watched for a while. There were the fast, short, young friends playing a step faster than everyone else. There was the savvy old guy who got a surprising number of rebounds and made all his shots. There was the insistent dribbler, who held the ball for way too long trying to get his shot. There was the lazy tall guy who couldn’t be bothered to run past the foul lines. There was the black hole, who’d find a way to shoot even if both hands were tied behind his back. There was even the cherry picker who almost never played D and thought he was better than he actually was just because he scored off long inbound passes. I hate that guy. It was refreshing, though, discovering that the game’s the same around the world. That certain things stay familiar. 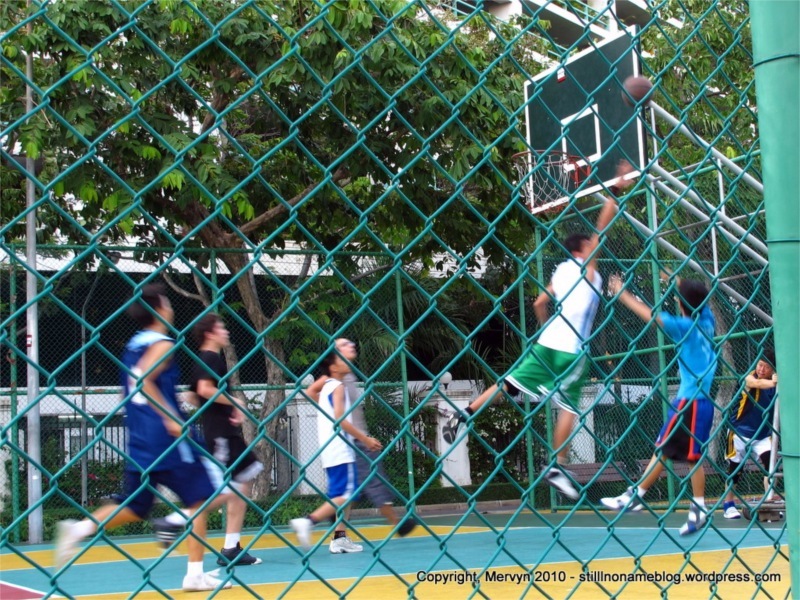 That what’s normal in a California pickup game still feels normal in Bangkok, Thailand. And really, that’s the thing. Outside of the transportation inconveniences and lighter crowds, the day felt normal. People were out with their families. Guys were arguing about the score. People were eating and reading on park benches. This, at a park that’s within walking distance of the protest site I’d been at the night before. I’m not naïve, though. There’s civil unrest in Bangkok. People are dying. Demonstrators are staring down police and soldiers, a powder keg about to explode. People are fighting for a democracy they can believe in. Others are trying to deal with a movement that’s trying to reinstall an exiled convicted felon and that’s turned confrontational and violent. That said, in the face of it all, life in Bangkok rolls on. That fact, more than the protests and the violence and the demonstrations, fascinates me.